Guest post from the Scriptonite Daily blog; the "Barnet Casino" video is from The Barnet Alliance (produced by Azi Khatiri, drawn by Ellis Nadler). It is clear and beyond doubt: it simply costs more to live in a state where the basics we need to survive are handed over to private interests to profit from. We had it better when we shared. So, the privatisation of our public services has seen a rise in personal debt; that makes sense. But one would think that there would have been a corresponding fall in public debt. Instead, as we have seen, the debt has risen. So what are they spending all this money on? 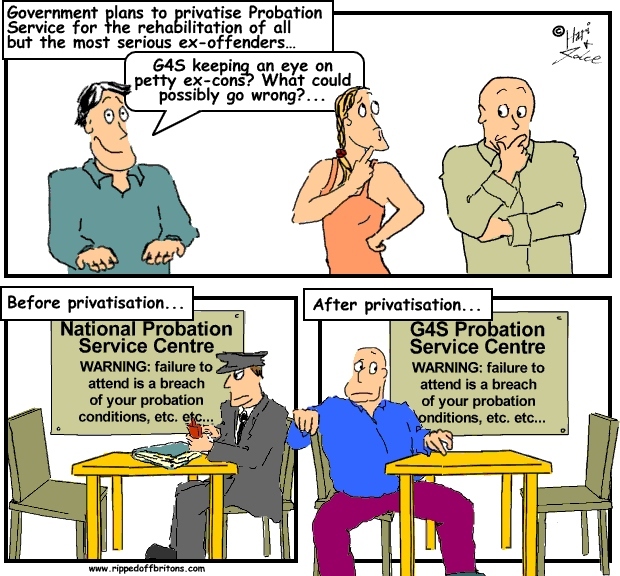 The truth is, they never really privatised as they said they did. They privatised profit, and they socialised investment and losses. It doesn’t matter which sector you choose, the role of the state has become handing out tax breaks and subsidies whilst acting as a guarantor against losses. This is the role of tax payer money which successive governments have prioritised above social utility – or making life better. The most obvious recent example was the Bankers Bailout. In the bailout of 2008/9, the UK government had to guarantee funding to the banking sector, of 101% of GDP. That is, the UK diverted over £2trillion of tax payer money from public expenditure, to a handful of banks. This is equivalent to almost 3 times its entire annual budget; twenty years of NHS spending (£106.7bn a year); forty years of education spending (£48.2bn); or five hundred years of job seekers allowance (£4.9bn a year). In the 2013 budget, George Osborne offered another £130bn to banks in the form of mortgage guarantees, effectively making it so banks can grant mortgages to people, reap the profits, but never fear a default as the government (you and me) will pick up the tab. Our hospitals and schools have been built under private loans called Private Finance Initiatives, rather than government borrowing. These loans are at least twice the rate of interest that government loans would have been. These loans are then repaid over 25-30 years. Today, 22 of the 103 NHS trusts to enter PFI are facing difficulty due to the exorbitant repayments required to pay back the so-called NHS Mortgage (paying back the company for building the hospital). Some hospitals are having to handover a fifth of their annual budget on paying for the PFI deal. In Education, it was revealed that we are due to have a shortfall of 250,000 school places for our children by 2014, whilst the tax payer has picked up a £70m bill for PFI schools which had to close. Overall, for a capital investment of £54.7bn (that’s how much money we actually borrowed to build stuff), the tax payer will pay back an astounding £301bn in just twenty five years. Given the disasters of debt witnessed so far, many of the 771 PFI projects currently running will bust the budget of these schools and hospitals long before then, leaving us with the debt but not the service. There has been massive outsourcing of the provision of public services, effectively leaving many services as public sector branded, tax payer funded private interests. I covered this extensively in an article last year so please see that for the full detail. Here I will use just one example, our courts. The cost of running a court room has increased to £110 a minute due to the rapid rise on private contractors high costs for security, language services, cleaning, transport, and so on. Companies such as G4S and Serco are making enormous profits, where once that money would have been used to pay staff, improve services, or simply never charged. G4S provide 800 staff to the Old Bailey. They charge £11.49 per security guard, while paying the guard just £6.45 – that’s just under £42m a year they make from this one court. This has been replicated in the health service, education, prisons, probation, the police force…everywhere. The result? The costs of the service rise exponentially, the service quality declines and the service itself becomes less and less accountable to us. While we have privatised rail, energy, utilities and energy – we continue to pay massive subsidies to the private companies running them now. When we aren’t handing money over directly, the government is letting them off paying their dues. 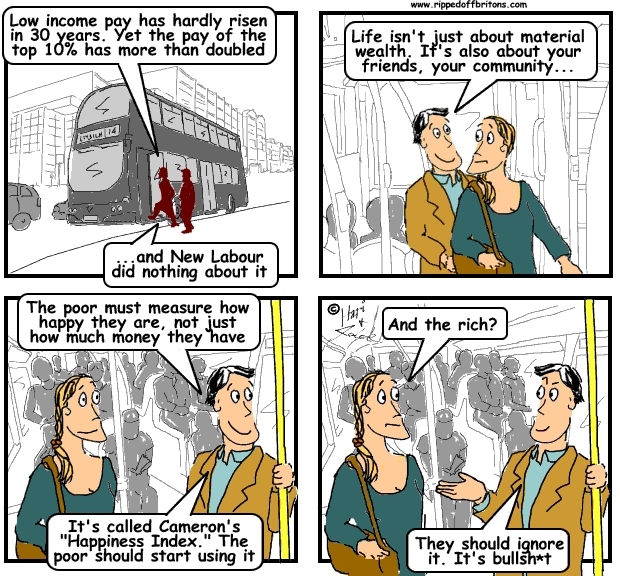 The UK government made £5.3bn by selling British Rail. This equates to a mere 3 years in the increased, yes increased, state subsidy agreed by the UK government. This means, the companies gave us £5.3bn in 1996, and we gave that back in subsidies in the following three years. Not only that, but we continue to pay the subsidy. In fact, today, the rail subsidy stands at £5.2bn per year. Fare-payers contribute £6.2bn per year. Therefore, we sold a service for £5.3bn in 1996, which we now rent back for £11.5bn per year. Gas and Oil prices were subsidised to the tune of £3.6bn in 2010, whilst renewable energy projects received just a third of that. And with the exception of the first two years of the financial crisis, this figure has risen consistently over time. Yesterday’s budget announced more of the same, with shale gas exploration receiving massive tax breaks. And finally, taxation. Only one in four of the UK’s top companies pay their taxes, meanwhile they were receiving tax credits to the tune of hundreds of millions of pounds by people who did pay their taxes. Company taxes now constitute only 12.5% (Corporation Tax is just 7%) of the tax revenues of the UK. In comparison, the people’s taxes, (income tax and VAT) make up more than 60% of the tax income. Corporation Tax is lower today than at any time in its history. 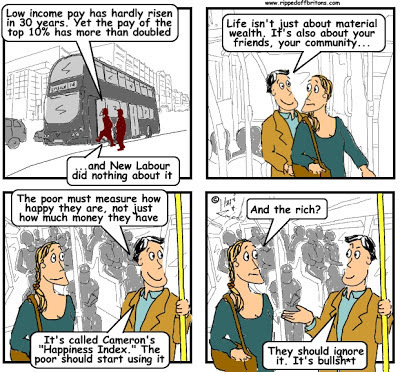 UK Corporation Tax in 1984 was 52%. By 1986 it was 36%. In 1999 it dropped to 30% and in the most recent budget it was cut to 20%. Meanwhile, tax avoidance is costing us almost £70bn each year. 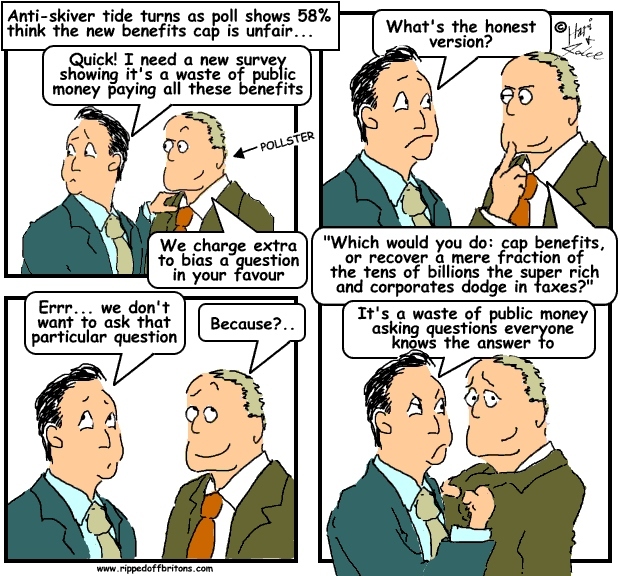 David Cameron lamented in a June 2012 speech “Today, almost one pound in every three spent by the Government goes on welfare.” The truth is Cameron wants that pound joining the other two, funding a tax payer subsidised corporate state. Every budget, every policy, every sound bite is designed to promote the ideas that have us facing spiraling debt, rising unemployment, crumbling infrastructure, bankrupt schools and hospitals and a rapidly eroding welfare state to mop up the mess. It is time for us to share the proceeds of our industrious, innovative, caring society with each other. It is time to end this parasitic relationship where the state is ever more simply the vehicle by which the few are delivered the profits of the endeavours of the many. Deliberate misdirection and misappropriation of funds, fraud and theft. Is what it is. Our wealth being deliberately siphoned off to provide the chosen few (Fine upstanding "tax payer's" like Richard Branson) Huge profits... alongside a ready and willing desperate pool of serf's. All party's have been complicit in this fraud since hatchet thatcher declared open warfare on the working man. They all know "debt" will never come down because of their system, Make no mistake... it is their system... not ours. Designed to defraud all of their wealth. (wealth is not money) the nature of money creation in itself is fraudulent... Though the current and last Governments have taken money fraud to new heights. They know the "Game" is up.